Here is my second collaboration I did with Kat from Grimm Girl, you can read my collab part by clicking here. Hello old friends and new friends! I’m excited to do my first collaboration post with Lita Kino. I got on touch with her on Twitter when she reached out to bloggers expressing her desire to work with other bloggers on some posts. This was a lot of fun and a great way to gain exposure to anime that I may not have tried without some encouraging from a friend. I’m a total novice so Lita suggested that we each recommend an anime to each other and do a review. 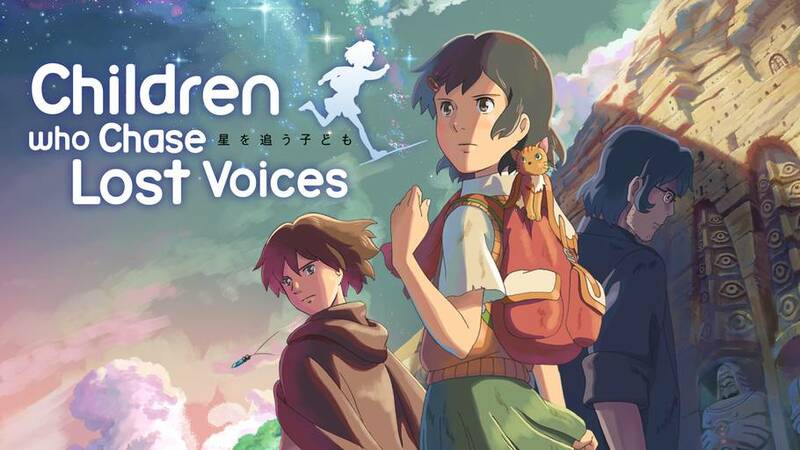 We settled on anime movies and I suggested My Neighbor Totoro for her to watch (one of my favorites) and she suggested I check out Children Who Chase Lost Voices a Makoto Shinkai film that was released in 2011. Remember when I said that this collaboration was a great chance for me to broaden my horizons? This is exactly what I was talking about. My knowledge of anime movies (that aren’t produced for anime shows i.e. Dragon Ball Z: Battle of the Gods) is severely lacking. On top of that I have only seen one other film by Makoto Shinkai and that was The Place Promised in Our Early Days. So I was interested in seeing more of his work. Now that you all know the full story we can finally start talking about Children Who Chase Lost Voices. I would like to start off by saying based on this description of the movie, gave me a completely different expectation than the movie actually provided. This is not the movie’s fault obviously but I want to point this out because going into this I was expecting something so much different. It threw me off a bit. From this description hear is what I was expecting; The radio was magic and transports her to a magical world. There she meets a band of warriors and learns about a faction of naysayers who are trying to bring back somebody from the dead. This is of course taboo and throughout her journey we all learn a lesson about why humans should never try to raise the end. The End. None of that happened. Am I weird? Am I the only one who got this vibe from the movie description? You will have to let me know if I’m just an oddball in the comment section below. Instead of the storyline I assumed the movie went more like this; Asuna a young girl living a lonely life due to the fact her father died and her mother constantly does her best to seem happy through her hardships. In her spare time she has constructed a place in the mountains for herself where she is able to listen to a radio she constructed using a crystal her father left behind as a memento. One day she meets a boy named Shun who appears to be from another world, but he quickly disappears. While trying to find answers she runs into a man named Morisake who is looking for the world Shun claimed to be from, Argartha. He is desperate to bring his wife back from the dead and believes that Shun’s homeland is the key. Asuna and Morisake make it to Aragartha only to encounter the boy’s younger brother Shin and other characters. Her experiences cause Asuna to question if bringing a person back to life is really an acceptable route. She also begins to consider how she feels about her life and what it is she’s actually hoping for while traveling through this new world. Personally I feel like that is a more adequate description but to each their own. I found myself having the same feelings about this movie as I had about The Place Promised in Our Early Days. The first thing that caught my attention was the soundtrack. I absolutely loved it. I also was once again blown away by the animation. There is an amazing attention to detail in the landscapes of this movie. This film, just like The Place Promised in Our Early Days is beautiful to watch. How this movie was formatted made it impossible for me to connect with the characters. I seemed to be always off the mark with this movie. Either things were happening to fast or to slow for me and because of it I kept missing connections. In short this movie didn’t make me feel. When the characters were in trouble I wasn’t worried about them, when they were sad I didn’t feel bad, when they laughed I didn’t chuckle, and when it ended I responded with a shoulder shrug and a, “Meh”. Sadly I was very nonchalant about this movie. Which actually really irritates me about myself right now. Where are my feels? I keep thinking about the story line and there are certainly some feel moments! There are times in the story line where I think, “Yeah, that’s interesting. I should react to that,” but I have nothing to bring to the table. I feel like there are probably people who have seen this movie that think I’m a crazy person, but I can’t help it. I just couldn’t seem to jive with the director’s style. Now this does not mean that this was a bad movie. I really hate when people act like a movie was bad just because it’s not their style. You can’t really criticize creative differences can you? I would say that this is a good movie; it’s just not my style of a movie. Since it wasn’t my style I wasn’t able to relate. I guarantee you though that there are a lot of people out there who do relate to this style and would find this movie to be stunning. So here’s my honest opinion, go watch the movie. Check it out. The worst that could happen would be that like me it just isn’t your style. In which case you still get to enjoy the breathtaking animation and soundtrack. At best you just stumbled onto something magical. I hadn’t heard about this but it doesn’t really look like my kind of thing. Thanks for sharing your thoughts on it. My anime movie knowledge is lacking so I was glad Lita suggested this to me. I haven’t heard of the Red Turtle either. What’s that about? I think my assumption def there me off in the beginning for sure. Which I don’t think helped me adjust to the pacing at all. I loved the animation and soundtrack. It was a very beautiful movie. I get what you mean about not jiving. When I watched 5 Centimeters Per Second I was expecting amazing, as it had often been described, but in the end I was just “eh?” on the whole thing. I can see why some like it but I just couldn’t connect with it. Great review! I’ve been wanting to check this movie out for awhile and even if I’m not a huge fan I love a good soundtrack.